University of California, Berkeley, astronomers have taken advantage of a recently mounted laser guide star system at UC's Lick Observatory to obtain sharp, twinkle-free images of the faint dusty disks of distant massive stars. The images clearly show that stars two to three times larger than the sun form in the same way as solar-type stars - inside a swirling spherical cloud that collapses into a disk, like that from which the sun and its planets emerged. The yellow laser beam piercing the heavens over Lick Observatory became operational on the 10-foot Shane telescope last year, expanding use of the telescope's "rubber mirror" system, called adaptive optics, to the entire nighttime sky. The addition of the laser makes Lick the only observatory to provide a laser guide star for routine use. The UC Berkeley team and its colleagues at UC Santa Cruz's Center for Adaptive Optics and Lawrence Livermore National Laboratory (LLNL) report their results in the Feb. 27 issue of the journal Science. "The paradigm for stars like our sun is gravitational collapse of a cloud to a protostar and a pancake-like accretion disk, but there's some mass at which this can't work - the luminosity of the star becomes sufficient to disrupt the disk, and it falls apart as fast as it pulls together," said James R. Graham, professor of astronomy at UC Berkeley. "Our data show that the standard model paradigm still works for stars two to three times as massive as the sun." "Without adaptive optics, we'd see only a big fuzzy blob from the ground and would be unable to detect any of the fine structure around the sources," added UC Berkeley graduate student Marshall D. Perrin. "Our observations provide strong support for an emerging view that low and intermediate mass stars form in a similar manner." An adaptive optics system, which removes the blurring effects of atmospheric turbulence, was added to Lick's Shane telescope in 1996. However, like all other telescopes with adaptive optics today, including the twin 10-meter Keck Telescopes in Hawaii, the Lick telescope has had to rely upon bright stars in the field of view to provide the reference needed to remove the blur. Only about one to 10 percent of the objects in the sky are sufficiently near a bright star for such a "natural" guide star system to work. The sodium dye laser, developed by ace laser scientists Deanna M. Pennington and Herbert Friedman of LLNL, finally completes the adaptive optics system so that astronomers can use it to view any part of the sky, whether or not a bright star is nearby. 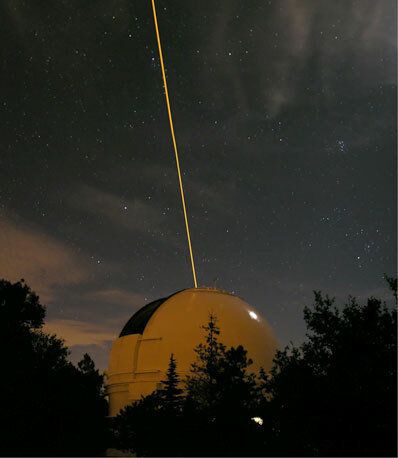 Strapped to the bore of the Lick telescope, the laser shines a narrow beam about 60 miles through the turbulent zone into the upper atmosphere, where the laser light stimulates sodium atoms to absorb and re-emit light of the same color. The sodium comes from micrometeorites that flame out and evaporate as they enter the Earth's atmosphere. The yellow glowing spot created in the atmosphere is equivalent to a 9th magnitude star - about 40 times fainter than the human eye can see. Nevertheless, it provides a steady light source just as effective as a bright distant star. "We use that light to measure the turbulence in the atmosphere over our telescope hundreds of times per second, and then use that info to shape a special flexible mirror in such a way that when the light, both from the laser and the target you are looking at, bounces off it, the effects of the turbulence are removed," said Claire Max, a professor of astronomy and astrophysics at UC Santa Cruz, deputy director of the Center for Adaptive Optics and a researcher at LLNL who has been working for more than 10 years to develop a laser guide star system. In one of the first tests of this system, Graham and Perrin turned the telescope on rare, young, massive stars called Herbig Ae/Be stars that are fuzzy from the ground and typically too faint to be imaged by natural guide star adaptive optics. Herbig Ae/Be stars, with masses between 1.5 and 10 times that of the sun and probably less than 10 million years old, are thought to be the beginnings of massive stars - stars that will end up like the hot, Type A stars Sirius and Vega. Herbig Ae/Be stars were cataloged years ago by UC Santa Cruz astronomer George Herbig, now at the University of Hawaii. The most massive of the Herbig Ae/Be stars are of great interest because they are the ones that undergo supernova explosions that seed the galaxy with heavy atoms, making solid planets and even life possible. They also trigger star formation in nearby clouds. What the astronomers saw was very similar to the known picture of T Tauri stars, which are the formative stages of stars up to 50 percent bigger than our sun and up to 100 million years old. Images of the two Herbig Ae/Be stars clearly show a dark line bisecting each star, caused by a disk blocking the star's bright glare, and a glowing spherical halo of dust and gas enveloping the star and disk. In each star, two jets of gas and dust can be seem emerging from the poles of the accretion disk. The two stars, catalogued as LkH-alpha 198 and LkH-alpha 233 (Lick hydrogen-alpha sources), are 2,000 and 3,400 light years away, respectively, in a distant region of the Milky Way galaxy. "Material from the protostellar cloud cannot fall directly into the infant star, so it first lands in an accretion disk and only moves inward to fall onto the star after it has shed its angular momentum," Perrin explained. "That process of angular momentum transfer, along with the evolution of magnetic fields, leads to the launching of the bipolar outflows. These outflows eventually clear away the envelope, leaving a newborn star surrounded by an accretion disk. Over a few million years, the rest of the material in the disk is accreted, leaving only the young star behind." Perrin added that the Hubble Space Telescope has provided "very clear-cut, unambiguous images of disks and outflows around T Tauri stars," confirming theories about the formation of stars like our sun. But, due to the relative rarity of Herbig Ae/Be stars, such clear data for those stars has been lacking until now, he said. Astronomers have proposed that very massive stars form from the collision of two or more stars, or in a turbulent cloud unlike the swirling accretion disk. Interestingly, a third star imaged the same night by Graham and Perrin turned out to be two sun-like stars with a ribbon of gas and dust between them, looking suspiciously like one star capturing matter from the other. Graham hopes to photograph more massive Herbig Ae/Be stars to see if the standard star formation model extends to even larger stars. The detailed images of the Herbig Ae/Be stars owe as much to the new laser guide star system as to a near-infrared imaging polarimeter built by Perrin and added to the Berkeley Near Infrared Camera (IRCAL) already mounted on the telescope. "Without a polarimeter, light from the stars largely obscures the structures around them," Perrin said. "The polarimeter separates unpolarized starlight from polarized scattered light from the circumstellar dust, which increases the detectability of that dust. Now that we've developed this technique at Lick, it will be possible to extend it to the 10-meter Keck telescopes as the laser guide star system there becomes operational." The polarimeter splits the light from the image into its two polarizations using a new type of birefringent crystal made of lithium, yttrium and fluorine (LiYF4), an improvement over the calcite crystals used to date. Many other groups are developing lasers to be used as guide stars, but Max's group has been ahead of its competitors since first demonstrating the concept in the early 1990s at Livermore. Since then, she and colleagues have been perfecting the laser and the software that allows the mirror - in the case of Lick's 120-inch telescope, a 3-inch secondary mirror inside the main telescope - to be flexed just right to remove the twinkle from stars. The 11- to 12-watt laser is a sodium dye laser tuned to the frequency that will excite the cold sodium atoms in the atmosphere. The dye laser is pumped by a green neodymium YAG laser, a bigger brother to the readily available green milliwatt laser pointers. "The reason we can now do science with the laser guide star system is that its reliability and usability is so much improved," Graham said. "The laser opens up adaptive optics to a much larger community." "I think it's going to be a workhorse instrument at Lick," added Max. "The laser itself and adaptive optics system hardware are pretty stable and pretty robust. What's going to happen now is that people are going to do astronomy with it, they're going to develop new techniques to observe with it, try it on new types of objects. In the typical way, a good astronomer will come and do things with your instrument that you never imagined." Max and her colleagues have tested an identical laser guide star system at the Keck Telescopes in Hawaii, but it is not yet ready for routine use, she said. "The Keck is using the same technology we have at Lick," Max said. "I expect to see this general technology used on most telescopes, but with different kinds of lasers. People are inventing new types of lasers right and left, so I think that game remains to settle out." Other authors of the Science paper, aside from Graham, Perrin, Max and Pennington, are affiliated with the National Science Foundation's Center for Adaptive Optics, centered at UC Santa Cruz: assistant research astronomer Paul Kalas of UC Berkeley, James P. Lloyd of the California Institute of Technology, Donald T. Gavel of UC Santa Cruz's Laboratory for Adaptive Optics, and Elinor L. Gates of the UC Observatories/Lick Observatory. The observations and development of the laser guide star were funded by the National Science Foundation and the U.S. Department of Energy.